Join British historian Bettany Hughes as she tours the eastern Mediterranean in search of the legend and facts behind the legend of "The Face that launched a thousand ships", Helen of Troy as Huges gives the viewer a true insight into ancient Greece. Although this DVD could be classed as a traditional documentary, Hughes also becomes modern day tour guide as she takes the viewer on a spectacular journey of the world of today and yesterday. 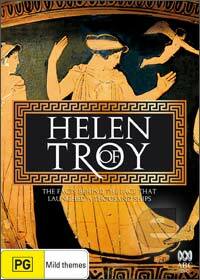 From the amazing citadel of Mycenae to the sacred shrine of Helen, Hughes painstakingly recreates how life would have been in these times from who Helen would be and how the lives of everyday citizens revolved around governments and gods. There's a great part in the documentary when Hughes recreates the recipes of the ancients thanks to modern archaeology and even tastes this food. Hughes also explores how the Greeks fought and made love that gives the viewer a true insight into this ancient culture without it being too dry and obscure. I must commend Bettany Hughes for making this documentary available and understandable by all. The video quality of Helen of Troy is brilliant and truly showcases the art and scenery of ancient Greece. As with all documentaries, unfortunately this DVD has no special features and hopefully in the future, more producers can throw in a special feature here and there. However it should be noted that this does not hamper the enjoyment of this title. In conclusion, Helen of Troy the Facts behind the Face is a brilliant DVD and if you enjoyed this documentary than I strongly suggest you visit Hughes "The Spartans" which is a similar vein at this current documentary and once again makes it understandable for the viewer and home historian. Brilliant!